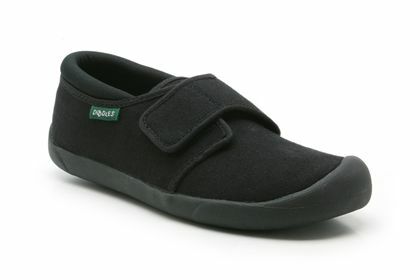 I'm a big fan of plimsolls for T - easy for her to put on independently, easy for us to clean and wash, and they work for pretty much every occasion. Plimsoll Mary Janes, Hamptons - the shoes were too wide on T, but she loved the flower pattern. They were also bit rigid for fabric shoes. I bought them through Trotters, but they're not available online anymore, and thus not pictured. Pink Flossys - I know the distinctive cotton-candy smell is their USP, but it was overpowering even after a few bouts in the washing machine and the North Sea (which added a fishy undertone). I wasn't unhappy when T outgrew them. Star Jump, Clarks - we haven't tried these since they only come in white (unsuitable for T) or black (T hates black clothes, so drama would have ensued each morning). Navy TOMS - I used to think TOMS were a bit of a fashion crime, upstart slippers that somehow tricked people into thinking they're fine to be worn as real shoes - but, like a victim of sartorial Stockholm syndrome, I've grown to like them more at each encounter. I myself can't fit into TOMS since I have an uncommonly high instep, but when T was due a new pair of plimsolls this fall I decided to trial them for her. I dithered a bit due to the price (even taking the CSR factor into account it seems inflated - though that seems to be a given for kids' shoes), but got them home for her to try. And she loved them. So unless we find something better, I see us working our way through the TOMS color and pattern spectrum over the next years.